Home Health & Safety Alert: 4 Indoor Air Quality Tests You Need to Do Now! Our round blue planet is becoming increasingly fragile day by day. One of the biggest global air quality threats we face is diminishing oxygen content and overall air toxicity. While many people think it is the outdoor air that is our biggest threat to health and safety, it is actually our indoor air that is often the most dangerous and toxic. The U.S. Environmental Protection Agency estimates that our indoor air at home, in the car, and at work may be up to five times more toxic than the air outside. Even with all we have learned about air filters, energy efficiency and cleaner, greener fuels, home cleaning products and building materials, somehow it still isn’t translating directly into cleaner air to breathe. We may not be able to solve all of the world’s problems (or at least not all at once), but there are some things you can begin to do right away to improve the quality of the air you breathe. This process begins with four key indoor air quality tests, which we will tell you about here. This first test establishes a foundation for all future indoor air quality action you decide to take. The indoor air quality test runs for 72 continuous hours. It is very quiet as it takes air samples, testing each for toxins and collating the results. At the end of the testing period, the device summarizes all found toxins and their levels in a full-colour report that includes recommendations for further action as needed. This test accomplishes two main tasks: It alerts you to naturally occurring and man-made toxins inside your home and outlines a plan to clean up your indoor air. Depending on the results of your indoor air quality test, you can proceed with further steps to clean, filter, purify, and humidity-balance your indoor air. For cleaning your indoor air, we recommend starting with a professional air duct cleaning and a professional dryer vent cleaning. This removes trapped dust, toxins, and detritus that otherwise are continuously added back into your home air supply. The High Efficiency Particulate Air (HEPA) filter was invented during World War II to protect scientists from exposure to radioactive particulate matter. It is still the most efficient, effective air filtration system in the world and can remove particles as small as 1/100th of a human hair from your indoor air supply! An ultraviolet air purification system harnesses the best natural purifier on the planet—ultraviolet light. It neutralizes airborne toxins before they ever get into your indoor air supply. A heat recovery ventilator not only ensures a steady supply of incoming fresh, oxygenated air but also removes excess humidity to keep mould and mildew away. Health Canada recommends that all homeowners have their homes tested for the presence of radon. Radon is a toxic radioactive gas that occurs naturally when uranium breaks down in soil, rock, and, in some cases, well water. Radon is not man-made—it is natural. Over time, uranium starts to decay and releases the radioactive gas known as radon. Different properties can have different levels of risk depending on how much natural uranium is present in the soil, rock, and water on the land itself. Why is radon a concern? In Canada, current estimates indicate as many as 16 percent of annual lung cancer deaths involve radon poisoning. This risk goes up if you smoke or use tobacco products. Radon is likely present inside of every home to some degree. But since it can’t be seen, tasted, or smelled, you are not likely to know it is there unless you install a radon alarm. A radon alarm continuously tests for radon levels and issues an alert if the levels increase to dangerous levels. In addition to installing a radon alarm to test your home for radon, you can also decrease the amount of radon that lingers in your home by improving the ventilation (we recommend installing a heat recovery ventilator for this purpose). Like radon, carbon monoxide cannot be seen, tasted, or smelled. It is called the “silent killer” for good reason! But unlike radon, carbon monoxide is not naturally occurring. Carbon monoxide is definitely human-made, produced when you burn fossil fuels, smoke (it is in the second-hand smoke), cook, drive your car, run a generator, fire up the backyard barbecue grill, and do other similar types of fuel-burning activities. While the winter season can be more concerning for carbon monoxide poisoning, since people spend more time indoors in the winter, the warm season is no slouch either when it comes to producing carbon monoxide! The only way to find out if your home has toxic levels of carbon monoxide is to install a carbon monoxide alarm. 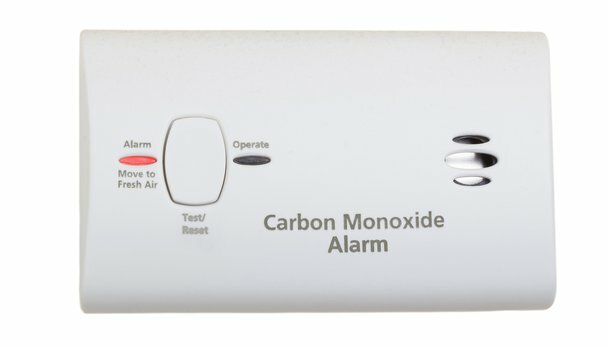 This alarm continuously tests your indoor air for carbon monoxide levels and sounds an alert when toxicity begins to climb to dangerous levels. Smoke detectors and fire extinguishers are considered required safety equipment in every home and workplace today. According to Canadian Firefighter, cooking and smoking are the two leading cause of home fires. Smoking is the leading cause of deaths due to home fires. More home fires begin in the kitchen, outdoor areas, living room, and bedroom than in other parts of the home. This makes these places top priority for installation of smoke detectors and fire extinguishers. Here, it also makes sense to put an alert on your calendar to check each of your smoke detector batteries monthly and to check your fire extinguisher expiration dates at least annually. Contact us online, or give us a call at 905-544-2470, to learn how you can save 10 percent on air duct cleaning packages and 20 percent on whole-home indoor air quality equipment!